Kenjon Fa'terrel Barner (born April 28, 1990) is an American football running back for the Atlanta Falcons of the National Football League (NFL). He played college football for the University of Oregon and received All-American honors. He was drafted by the Carolina Panthers in the sixth round of the 2013 NFL Draft. Barner has also played for the Los Angeles Chargers, Philadelphia Eagles and New England Patriots. Barner attended Notre Dame High School in Riverside, California, where he played for the Notre Dame Titans high school football team. Considered a three-star recruit by Rivals.com, Barner was listed as the No. 38 running back in the nation in 2008. Barner at Oregon in 2010. A native of Southern California, Barner chose to attend the University of Oregon and play for head coach Chip Kelly's Oregon Ducks football team. He was ranked by Rivals as the 38th best running back prospect in the country, as well as the 86th overall prospect from the state of California Barner chose Oregon over scholarship offers from Arizona State and UTEP. Barner is the first Oregon Duck since 1965 who has scored touchdowns rushing, receiving, and from punt and kickoff returns. In the 2009 season, Barner had 61 carries for 366 yards and three rushing touchdowns to go along with 41 kick returns for 1,020 net yards and a 100-yard kick return touchdown, which came against the UCLA Bruins. In the 2010 season, Barner's role on the offense expanded. In the season opener against New Mexico, he had 17 carries for 147 rushing yards and four rushing touchdowns to go along with a 60-yard touchdown reception. In the next game, a victory over Tennessee, he had a punt return touchdown. He suffered a career-threatening concussion after a helmet-to-helmet hit against Washington State on October 9. In the annual rivalry game against Oregon State, he had 15 carries for 133 rushing yards and a touchdown. Overall, he had 551 rushing yards, six rushing touchdowns, 121 receiving yards, two receiving touchdowns, 13 kick returns, 236 net kick return yards, 10 punt returns, 132 net punt return yards, and a punt return touchdown in the 2010 season. In the 2011 season, Barner was the second leading rusher in the Ducks' backfield. On September 24, against Arizona, he had 72 rushing yards, two rushing touchdowns, and two receptions for six yards and a receiving touchdown. On October 15, against Arizona State, he had 31 carries for 171 rushing yards and a touchdown. He followed that up with 115 rushing yards and two rushing touchdowns in a victory over Colorado. On November 19, against Southern California, he had 123 rushing yards and two rushing touchdowns. Overall, in the 2011 season, he had 939 rushing yards, 11 rushing touchdowns, 17 receptions, 184 rushing yards, and three rushing touchdowns. 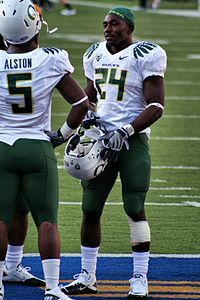 Barner was considered one of the top running back prospects for the 2012 NFL Draft before announcing he would return to Oregon, where he succeeded LaMichael James as the team's main running back. He was named a top contender for the 2012 Heisman Trophy, eventually won by freshman sensation Johnny Manziel. In the season opener against Arkansas State, Barner had 66 rushing yards and two rushing touchdowns. In the second game, he had 201 rushing yards and three rushing touchdowns in a victory over Fresno State. On September 29, against Washington State, he had 195 rushing yards and three rushing touchdowns to go along with three receptions for 37 yards and a receiving touchdown. On October 18, against Arizona State, he had 143 rushing yards and three rushing touchdowns. On November 3, he set a rushing record for Oregon and for USC Trojans football opponents, with 321 rushing yards; he also scored five touchdowns in the game. In the final game of the regular season, he had 198 rushing yards and two rushing touchdowns in a victory over Oregon State. The Ducks won the 2013 Fiesta Bowl over Kansas State with Barner having 143 rushing yards and a 24-yard touchdown reception. Following his senior season, Barner was named to the AP All-American second team and the All-Pac-12 Conference First Team. He finished in ninth place in the 2012 Heisman Trophy voting. Barner joined the track team following the completion of football's spring drills and competed in two meets at 100 meters and on the 4 × 100 meter relay. He ran the third-leg on Oregon's fourth place 4 × 100 meter relay team at the Pac-10 Championships, where Oregon won its fourth-straight league title with a season-best time of 40.36 seconds. At the 2010 Pac-10 Conference Championships, he ran a career-best time of 10.71 seconds in the 100 meters, finishing 14th in the prelims. He placed 3rd in the 200 meters at the 2011 Oregon Relays, with a time of 22.29 seconds. He also placed 3rd in the 60 meters at the 2011 Washington Husky Invitational, at 7.09 seconds. On April 27, 2013, Barner was drafted by the Carolina Panthers in the sixth round (182nd overall) of the 2013 NFL Draft. In his rookie year, Barner played a limited role on special teams. He had six carries for seven yards and two catches for seven yards. On August 19, 2014, Barner was traded to the Philadelphia Eagles for a conditional seventh round pick in 2015. The trade reunited Barner with his former head coach at University of Oregon, Chip Kelly. He was released on August 30, 2014. On November 4, 2014, he was signed to the Philadelphia Eagles' practice squad. During the 2015 preseason, Barner attempted to make the roster behind three former NFL starters, DeMarco Murray, Ryan Mathews and Darren Sproles. Looking to make an impact in the return game, Barner found near immediate success. In the first preseason game against the Indianapolis Colts he returned a punt 92 yards for a touchdown to end the second quarter. In the second preseason game against the Baltimore Ravens, he returned another punt for a 68-yard touchdown. He made the roster and ended up with 124 rushing yards and 22 receiving yards in the 2015 season. Barner played in 13 games in 2016, rushing 27 times for 129 yards and two touchdowns and recorded five receptions for 42 yards while contributing on special teams as a returner. He was placed on injured reserve on December 20, 2016. On March 20, 2017, Barner signed a one-year contract with the Los Angeles Chargers. He was released on September 2, 2017. 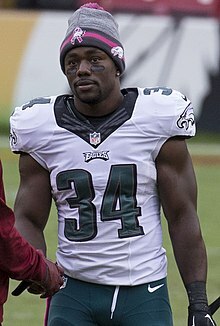 On September 26, 2017, Barner signed a one-year deal with the Philadelphia Eagles after an injury to running back Darren Sproles. In Week 5, Barner averaged 36 yards on three punt returns, including a 76-yarder, in a 34-7 win over the Cardinals, earning him NFC Special Teams Player of the Week. He finished the regular season with 57 rushing yards, one rushing touchdown, 56 receiving yards, 10 kick returns for 194 net yards, and 27 punt returns for 240 net yards. The Eagles finished the season 13-3, clinching the NFC East division. The team reached Super Bowl LII, where they defeated the New England Patriots 41-33, winning their first Super Bowl. In the game, Barner had three kick returns for 73 net yards. On May 11, 2018, Barner signed with the Carolina Panthers. He was released on August 31, 2018, as part of final roster cuts. On September 11, 2018, Barner signed with the New England Patriots. On September 19, 2018, the Patriots released Barner, but re-signed him a week later after Rex Burkhead was placed on injured reserve. He was released again on October 4, 2018 before Barner was re-signed four days later. On November 13, 2018, the Patriots released Barner. On November 14, 2018, Barner was claimed off waivers by the Carolina Panthers. He was placed on injured reserve on December 28, 2018. He had 19 carries for 71 yards on the 2018 season. On March 14, 2019, Barner signed a one-year contract with the Atlanta Falcons. Barner was born in Lynwood, California to parent Wilhelmenia Barner. He has five older brothers and one older sister. He graduated with a degree in criminology in spring 2012. While attending the University of Oregon, he was given an honorary membership to the Sigma Phi Epsilon fraternity. Barner’s cousin Melvin Carter was elected mayor of St. Paul, Minnesota in November 2017. His current girlfriend is Laura Dominguez. They met in high school and were friends for 10 years before they started dating. They have one son. ^ "Kenjon Barner Pro-Football-Reference Profile". rbref.com. ^ Klein, Gary (December 1, 2011). "Kenjon Barner is perfect complement to Oregon's attack". Los Angeles Times. ISSN 0458-3035. Retrieved March 30, 2018. ^ "Kenjon Barner College Stats". College Football at Sports-Reference.com. Retrieved March 30, 2018. ^ a b c d Bishop, Greg (October 26, 2012). "A Duck's Odd Path to Prestige". New York Times. Retrieved October 27, 2012. ^ "Oregon at UCLA Box Score, October 10, 2009". College Football at Sports-Reference.com. Retrieved March 30, 2018. ^ "Kenjon Barner 2009 Game Log". College Football at Sports-Reference.com. Retrieved March 30, 2018. ^ "New Mexico at Oregon Box Score, September 4, 2010". College Football at Sports-Reference.com. Retrieved March 30, 2018. ^ "Oregon at Tennessee Box Score, September 11, 2010". College Football at Sports-Reference.com. Retrieved March 30, 2018. ^ "Oregon at Oregon State Box Score, December 4, 2010". College Football at Sports-Reference.com. Retrieved March 30, 2018. ^ "Kenjon Barner 2010 Game Log". College Football at Sports-Reference.com. Retrieved March 30, 2018. ^ "2011 Oregon Ducks Stats". College Football at Sports-Reference.com. Retrieved March 30, 2018. ^ "Oregon at Arizona Box Score, September 24, 2011". College Football at Sports-Reference.com. Retrieved March 30, 2018. ^ "Arizona State at Oregon Box Score, October 15, 2011". College Football at Sports-Reference.com. Retrieved March 30, 2018. ^ "Oregon at Colorado Box Score, October 22, 2011". College Football at Sports-Reference.com. Retrieved March 30, 2018. ^ "USC at Oregon Box Score, November 19, 2011". College Football at Sports-Reference.com. Retrieved March 30, 2018. ^ "Kenjon Barner 2011 Game Log". College Football at Sports-Reference.com. Retrieved March 30, 2018. ^ Miller, Ted (January 14, 2012). "Kenjon Barner returning to Oregon". ESPN.com. Retrieved January 19, 2012. ^ "2012 Oregon Ducks Stats". College Football at Sports-Reference.com. Retrieved March 30, 2018. ^ Sparks, Adam (October 20, 2012). "Oregon's Kenjon Barner Continues Building a Case for Heisman". Archived from the original on April 21, 2014. ^ "Arkansas State at Oregon Box Score, September 1, 2012". College Football at Sports-Reference.com. Retrieved March 30, 2018. ^ "Fresno State at Oregon Box Score, September 8, 2012". College Football at Sports-Reference.com. Retrieved March 30, 2018. ^ "Oregon at Washington State Box Score, September 29, 2012". College Football at Sports-Reference.com. Retrieved March 30, 2018. ^ "Oregon at Arizona State Box Score, October 18, 2012". College Football at Sports-Reference.com. Retrieved March 30, 2018. ^ "Kenjon Barner, No. 2 Oregon beat No. 18 USC 62-51 (Top 25)". AL.com. Associated Press. November 3, 2012. ^ "Oregon at USC Box Score, November 3, 2012". College Football at Sports-Reference.com. Retrieved March 30, 2018. ^ "Oregon at Oregon State Box Score, November 24, 2012". College Football at Sports-Reference.com. Retrieved March 30, 2018. ^ "Fiesta Bowl - Oregon vs Kansas State Box Score, January 3, 2013". College Football at Sports-Reference.com. Retrieved March 30, 2018. ^ "Pac-12 football awards and all-conference team announced". Pac-12. ^ "2012 Heisman Trophy Voting". College Football at Sports-Reference.com. Retrieved March 30, 2018. ^ "TFRRS - Pac-10 Track & Field Championships". www.tfrrs.org. ^ "Pac 10 Conference Championship - Complete Results". ^ "2013 NFL Draft Listing". Pro-Football-Reference.com. Retrieved March 30, 2018. ^ "Kenjon Barner 2013 Game Log". Pro-Football-Reference.com. Retrieved March 30, 2018. ^ Brinson, Will. "Panthers trade former Oregon RB Kenjon Barner to Eagles". CBSSports. Retrieved August 20, 2014. ^ "Colts vs. Eagles - Box Score - August 16, 2015 - ESPN". ESPN.com. ^ "Ravens vs. Eagles - Box Score - August 22, 2015 - ESPN". ESPN.com. ^ "Kenjon Barner 2015 Game Log". Pro-Football-Reference.com. Retrieved March 30, 2018. ^ "Kenjon Barner 2016 Game Log". Pro-Football-Reference.com. Retrieved March 30, 2018. ^ "Eagles Activate RT Lane Johnson From Suspended List, Place RB Kenjon Barner On I.R." December 21, 2016. ^ Henne, Ricky (March 20, 2017). "Chargers Sign Speedy RB Kenjon Barner". Chargers.com. ^ McPherson, Chris (September 26, 2017). "Eagles Bring Back RB Kenjon Barner On One-Year Deal". PhiladelphiaEagles.com. ^ Lewis, Edward (October 11, 2017). "Aaron Rodgers, Earl Thomas among Players of Week". NFL.com. ^ "Kenjon Barner 2017 Game Log". Pro-Football-Reference.com. Retrieved March 30, 2018. ^ "2017 NFL Standings & Team Stats". Pro-Football-Reference.com. Retrieved March 30, 2018. ^ Strickland, Bryan (May 11, 2018). "Panthers sign Kenjon Barner". Panthers.com. ^ Henson, Max (August 31, 2018). "Panthers announce first wave of cuts". Panthers.com. ^ "Patriots Sign RB Kenjon Barner and WRs Corey Coleman and Bennie Fowler". Patriots.com. September 11, 2018. ^ Hill, Rich (September 19, 2018). "Patriots sign former second round pick Cyrus Jones off the Ravens practice squad, release Kenjon Barner". PatsPulpit.com. ^ "Patriots activate WR Julian Edelman to the 53-man roster". Patriots.com. October 4, 2018. ^ "Patriots Activate DB Duke Dawson to the 53-Man Roster". Patriots.com. November 13, 2018. ^ "Panthers claim Kenjon Barner". Panthers.com. November 14, 2018. ^ Strickland, Bryan (December 28, 2018). "Dorian Johnson added to 53-man roster; Kenjon Barner to IR". Panthers.com. ^ "Kenjon Barner 2018 Game Log". Pro-Football-Reference.com. Retrieved March 6, 2019. ^ McFadden, Will (March 14, 2019). "Falcons agree to terms with running back Kenjon Barner". AtlantaFalcons.com. ^ Barner, Kenjon (January 3, 2018). "Kenjon Barner on Twitter". @kbdeuce4. Retrieved March 6, 2019. Wikimedia Commons has media related to Kenjon Barner.